Today, I attended another invited talk on climate change and sea ice. Last summer in August during the unprecedented cyclonic storm (first ever recorded in the summer with 70 kt winds), he watched someone surfing in Barrow. He thought that the arrival of surfers to the north coast of Alaska to be one of the most significant indicators of global warming. There is usually no waves let alone enough for someone to surf. 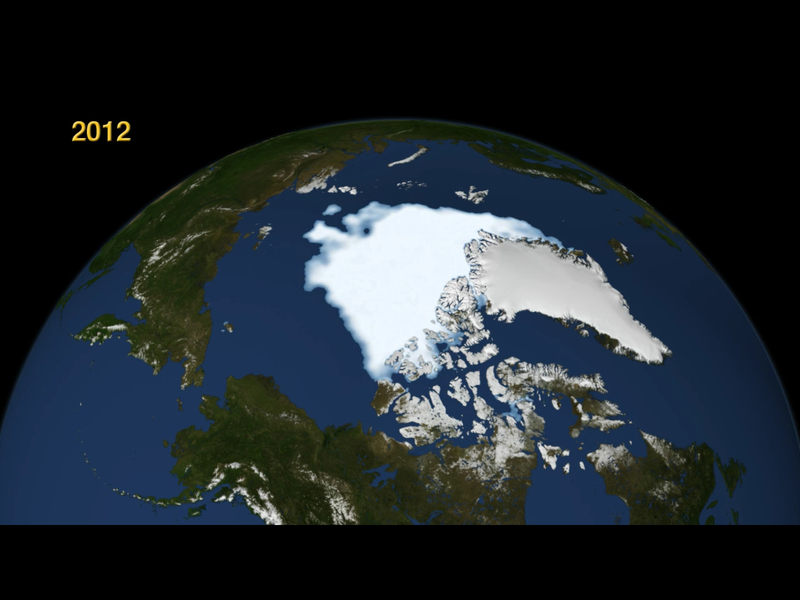 The image to left comes from a page with videos of minimum sea ice extent for the last 33 years. Another climatologist presented about the correlation between open water in the arctic and winter time temperatures in the continental United States. Essentially, the less sea ice, the colder the winters along the eastern seaboard and warmer in the southwest. He was comparing different simulation models which all gave similar results. So his conclusion was that global warming translates to more severe winters in the eastern U.S. The sessions I judged this afternoon were mostly ones with a lot of computer modeling so a lot of math. But the students did very well with their presentation and the canned questions. I say canned as they usually came from the same area where they were sitting and only after no other questions were asked. 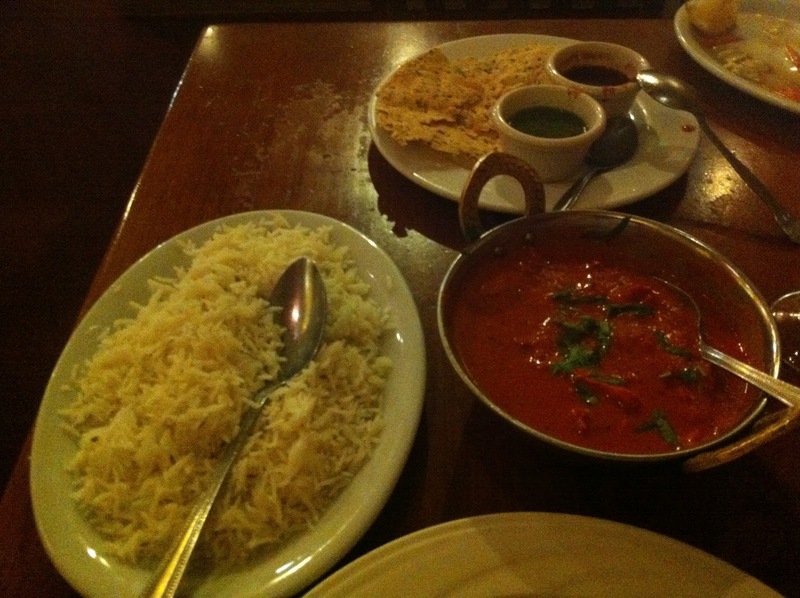 Dinner this evening was back at the Indian restaurant diagonal from the hotel. Today was butter chicken and jasmine rice with garlic naan and a salted lassi. The butter chicken was highly recommended on Yelp and I thought it was okay but not very spicy. The garlic naan wasn't as "garlicky" as the other place across the street but still very tasty. I could've took half of this home but all I took was the naan as it may make a good breakfast. Only 28,272 steps today or about 13 miles. I feel like a slacker especially since I didn't enter the 5K fun run this morning. I know the weather here has certainly been different. Surfing in Barrow. Now, there is a concept. What he was saying seemed to make sense. Ocean temperature measurements others have made in the Arctic Ocean show that it has risen +6°C in the last 30 years. That is extremely fast. Now we've got past the denier nutters the question is what do we do next? Have we? This was a large group of scientists and academics who don't disagree on what is observable but may disagree on origin. I am under the impression that there isn't much that we can do anymore as it is possibly too late for things to recover. It is interesting to hear how the sea ice, or lack thereof is changing the weather on the Eastern Seaboard. We all know the climate is changing but to hear of surfers in Barrow is something else. Wonder what will happen to the polar bears and such that depend on the ice for winter hunting. All this work is still in it's early state but I still find the science very interesting. I hadn't heard of the Barrow surfer before but did notice back in October how rough the sea was. The unprecedented storm they mentioned in August 2012 was followed by a less severe storm in September. These are the storms which washed out the road to the Point. it's amazing how we are all so inter-related. Never would have thought about the worse weather on the Atlantic Coast, but they did just have a bad storm. It is amazing to see how what happens at one place has an impact to things going on at other parts of the world. There have been a lot of discussion on the melting of the ice sheets in Greenland and Antarctica. Since those ice sheets are actually above sea level, they would dramatically impact world wide sea level. One interesting result of the model showed warmer than average termperatures in January on the east coast. BTW, the models also suggest even wetter weather in the PNW. Pretty interesting stuff. I find this disturbing ". . . suggest even wetter weather in the PNW . . . "
I thought that this would get your attention. There are a lot of theories and models floating around and all are attempting to explain what has happened and then trying to extrapolate into the future. I'm no expert at all, just an interested observer. And there is a lor of interesting things going on. So have your dessert first! No long motorcycle road trips planned for 2013. Future surfing capital Barrow? I bet somebody is already working on accelerating the effect. Climate change is an interesting and controversy topic, and it's for sure happening.